Want to Visit the Historic Berchtesgaden Salt Mine? The stop at the Berchtesgaden Salt Mine is the highlight of AESU’s Great Escape Tour. The stop at the Berchtesgaden Salt Mine is one of the highlights of AESU’s Great Escape Tour. Journey to the foot of the Alps and view this centuries-old mine to learn about salt, how the mine works, and how salt impacted the surrounding towns and cities. You may not know it but salt played a major part in shaping civilization. Salt has started wars, promoted technological advances and every winter it saved our ancestors from starving. Salt is even embedded in our everyday vocabulary. Salt was once used as currency and Roman soldiers were sometimes paid in salt. That’s where the saying ‘worth his salt’ comes from. The word salary is derived from this practice too (sal dare means to give salt in Latin). You’ll learn all this and even more fun facts about salt during your stop at the Berchtesgaden Salt Mine! 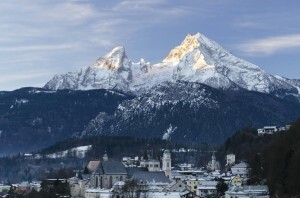 The city of Salzburg was not exempt from the impacts of salt; it’s even named after salt. The Berchtesgaden mine is located some 20 km outside of Salzburg and has been a source of resources and revenue for the area since 1193. The mine was officially created in 1517 and is responsible for much of the economic success the surrounding area has had. The mine is still functioning today, much in the same manner in which it was founded. Berchtesgaden uses wet mining, which means fresh water is pumped through the mountain and the salt is leached out of the bedrock. This turns the water into a brine that is about 26.5% salt. The brine is then pumped up to the surface to be treated and made into all kinds of salt products (all of which are available for sale at the mine’s souvenir store). Originally these pumps were wooden but they were updated to 14-ton brass pumps in the early 1800s. At the time the brass pumps were considered to be an engineering marvel and one of them is still on display today. Get adventurous and head underground! The interior of the mine remains steady at a cool 12 degrees Celsius. Because it’s a little chilly, the mine outfits each tour participant with a blue jumpsuit. The jumpsuit also protects your clothes as you journey into the mine, down 2 huge, wooden slides. One slide is 34 meters long, the other is 40 meters long and both are very steep– not your typical playground slides! But if embracing your inner child and flying down a slide isn’t your thing, don’t worry; there are stairs you can take instead. The mine also features a salt cathedral, a salt grotto, a funicular and an underground lake with water so clear and still it looks like a giant mirror, hence the name, Mirror Lake. Trust us! This journey underneath the Alps is worth the stop! Want to visit the historic Berchtesgaden Salt Mine? Please contact AESU by calling 800-638-7640 or fill out the contact form found on our website. And don’t forget to check out all of our great Travel Tips, especially the Travel Tips for Europe, before you head overseas. This entry was posted on Thursday, April 16th, 2015	at 2:50 pm	. You can follow any responses to this entry through the RSS 2.0	feed. Both comments and pings are currently closed.